This second edition takes the reader further into the heart of using drama for healing. A pioneer and leading trainer in the field, Dr. Emunah offers an expanded understanding of her Integrative Five Phase model, a foundational approach that embraces the wide spectrum of possibilities within the playing field of drama therapy in a progressive framework that accentuates emotional expression/containment, relationship, and perspective. Grounded by compassionate clinical examples, the book offers tools for action-oriented treatment, embodied therapeutic interventions, and creatively engaging a wide variety of clients. This lively and comprehensive text contains over 120 techniques, categorized by phases in the session and treatment series, and subcategorized by therapeutic objective, as well as numerous ideas and guidelines for drama therapists and other practitioners. Process-oriented drama therapy (group and individual) as well as performance-oriented forms are described in vivid detail. New to the second edition is an exploration of drama therapy outside of the clinical arena, including dramatic methods in family life and parenting, and drama therapy geared toward social change. Renée Emunah, PhD, RDT, BCT is a pioneer and international leader in the field of drama therapy. She is the founder/director of (and professor in) the graduate drama therapy program at the California Institute of Integral Studies. She is co-editor of the books Current Approaches in Drama Therapy and The Self in Performance: Autobiographical, Self-Revelatory and Autoethnographic Forms of Therapeutic Theatre; and recipient of the North American Drama Therapy Association’s highest award for Outstanding Contribution to the Field of Drama Therapy. 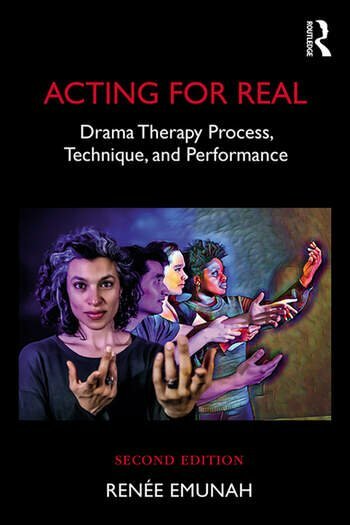 This second edition of Acting for Real is a luminescent polishing of one of the field’s core texts. Dr. Emunah’s many decades of experience as clinician and teacher lend substance, intelligence, and humility. Developmentally sequenced organization of methods are conceptualized within a humane, rational, and culturally competent framework. It’s rare that a second edition is so much more valuable than the first, but such is the case here! This book will be a primary reference for drama therapists across the globe. Acting for Real presents an all-encompassing arc of drama therapy, from a therapeutic art to an understanding of the neuroscience of changes in the brain from experience. With a heart-warming style of writing that draws the reader to want to go onto the next chapter, Dr. Emunah offers an excellent progressive structure for using drama therapy. The book will also bring you to tears as you read about the author’s work with people. A must-have book for anyone seeking to use experiential methods in therapy or for societal change. Drama therapy transcends ordinary psychotherapy! This book merits being used by all drama therapists, psychodramatists, and creative arts therapists. Dr. Emunah’s clinical work inspires me to integrate drama into my own practice and teaching, for it clearly fosters vulnerability, authenticity, mindfulness, empathic connection, and the courage to change. This book also depicts the use of drama to foster well-being and inclusion outside of clinical arenas, including acting against injustice, thereby creating a healing force for community. Stephen Murphy-Shigematsu, PhD, professor, Stanford University School of Medicine; author, Multicultural Encounters and From Mindfulness to Heartfulness.